This whole area, on the terrace of the UB city mall, looks out of India, precisely someplace out of Europe. Beautiful setting, wonderful ambiance all over and some great places to eat. While we were spoilt for choice, we chose the one with umbrellas, the first cafe called Cafe Noir. 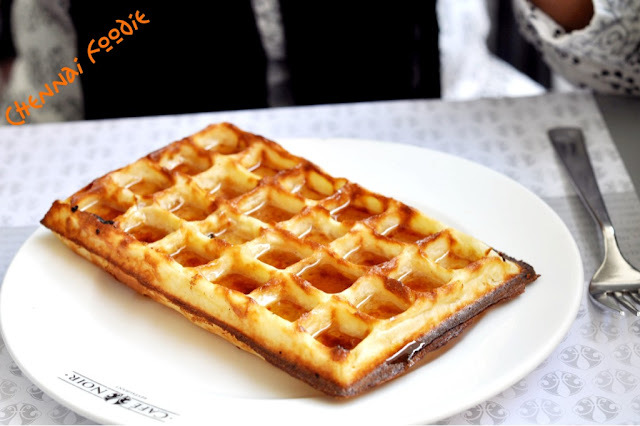 I have heard about their waffles and desserts and that is why the choice. We ordered a chicken quiche and a simple waffle with maple syrup. The quiche was amazing, crusty outside, super tasty meat filling inside and served with a nice green salad. The waffle however was nice, but not out of the world. I have had better waffle elsewhere, but this is no way was a bad waffle. The creme bru lee here is supposed to be wonderful, but that day, it was not available so we missed out. Service was a bit rude. We were given a small table though the place was very empty and there were a lot of tables on the outside that could have had us seated comfortably, but I guess, along with the ambiance, the attitude is foreign too. This mall is a must visit if you hit bangalore and the terrace eateries are brilliant. My next visit here, god willing, I plan to try Fava, the Mediterranean outlet. 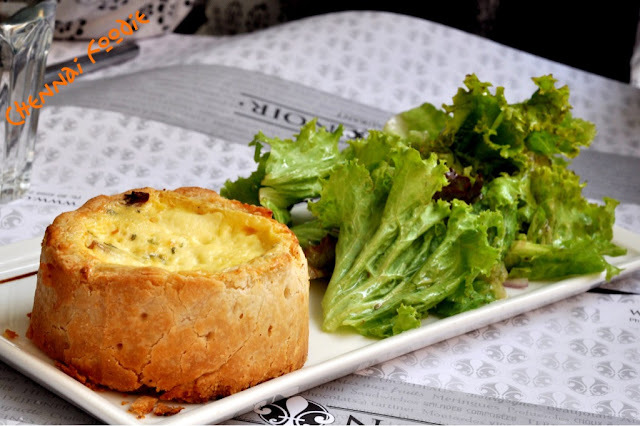 Cafe Noir is on the UB City mall terrace.